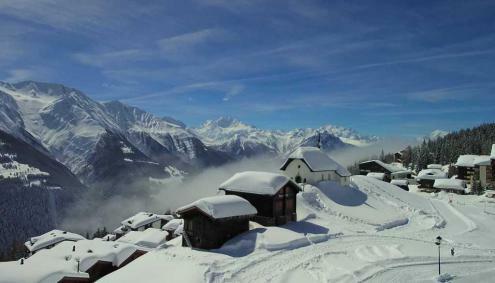 Conditions across the Alps are fantastic right now thanks to significant new snow in most areas. The greatest snowfalls (1m to 1.5m) have been close to the Swiss-Italian border roughly east of Zermatt/Saas-Fee, along the main Alpine ridge towards St Moritz and as far north as Andermatt. The north-eastern Austrian Alps (e.g Salzburgland) have seen the least snow, with just a dusting today. The vast majority of the Alps, however, have seen 20cm to 80cm of new snow over the last couple of days, which will make for some excellent skiing for anyone lucky enough to be out there over the next couple of days. That said, take care off-piste as the risk of avalanche is very high. A lot of snow has fallen in the south-western Austrian Alps over the last couple of days, but not so much in the north-east. Resorts that have done particularly well are those in the south-west, close to the Italian border, such as Obergurgl (90/165cm) and Sölden (5/502cm), both of which have received at least 50cm of new snow. Avalanche danger may hamper lift and piste openings today but snow conditions will be epic once resort authorities have made the main areas safe. Further north and east there has been less snow, but you can still find some good skiing here, especially in higher resorts such as Obertauern (230/250cm). All French resorts have seen significant snow from the latest storm. Some of the biggest falls have been in the southern Alps, with as much as 80cm at altitude in Les 2 Alpes (70/160cm). Further north, fresh snowfall totals have been closer to 20-40cm but snow conditions are also excellent in the likes of Flaine (115/300cm) and Les Arcs (45/300cm), especially as the weather is brighter today. There is some powder this morning even lower down, in the likes of Les Gets (40/130cm), though given the time of year, it won’t be long before spring-snow conditions return. 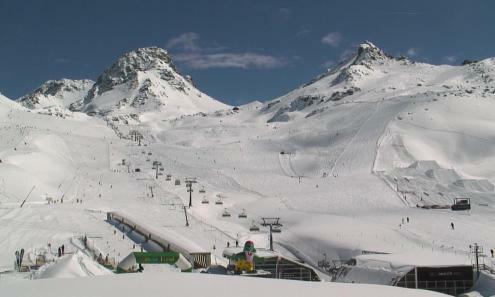 Many Italian resorts have seen significant new snow in the last couple of days, with close to 1m at altitude in Cervinia (85/255cm) and across the Monte Rosa region (70/250cm) where the skiing is superb in the brighter weather today. Further east, the likes of Livigno (125/280cm) and Passo Tonale (60/450cm) have also seen huge snowfalls and will be offering fabulous snow conditions over the next few days. Even the Dolomites have got in on the action, despite some of the resorts in the region already being closed or about to close. Cortina (20/160cm) is one of the few resorts that will continue to operate throughout most of the month. 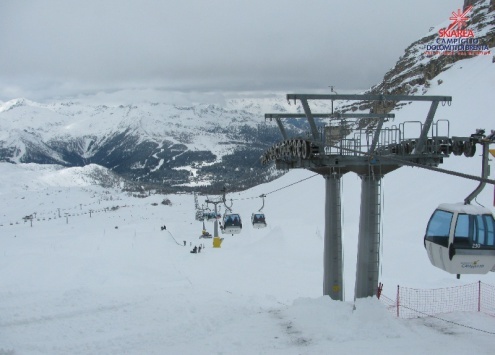 All Swiss resorts have seen significant snow from the recent storm, with over 1m falling at altitude in some central-southern and south-eastern resorts such as Andermatt (100/600cm) and St Moritz (85/220cm). Further north, conditions are also superb in the likes of Mürren (135/375cm) and Klosters (100/270cm) though, given the time of year, it won’t be long before spring-snow conditions become the norm once more, at least lower down. 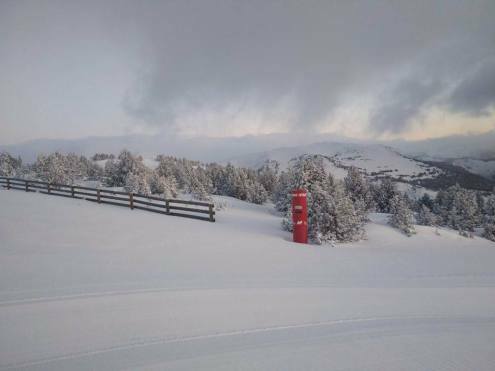 The Pyrenees have also seen some snow in recent days, though many resorts are either closed or about to close in the next week or so. Spain’s Baqueira Beret has settled snow depths of 85/185cm, while Andorra’s Granvalira has 40/105cm. There is plenty of good skiing on offer in Scandinavia, even if snow conditions are often quite spring-like, especially lower down. All 48 runs are currently open in Norway’s Hemsedal where the upper base is 110cm. Further north, Sweden’s Åre is also fully open, with 89cm on its upper slopes. Heavy snow in Scotland, especially in the east, means that some decent skiing is possible this weekend, after what has otherwise been one of the poorest seasons on record. Cairngorm saw 40cm of new snow this week although cover remains on the thin side lower down. There is still plenty of good skiing on offer in the western US even if some resorts are starting to wind down for the season. Vail has an upper base depth of 188cm but spring-snow conditions on the lower half of the mountain. It has also been mild in Snowbird where the mid-mountain base is now an impressive 391cm deep. However, it is the Californian resorts which currently have the deepest snow-packs, with Mammoth (571cm upper base) scheduled to stay open until July! There hasn’t been a huge amount of snow in Whistler (226cm upper base) in the last week, but it is snowing again today and will continue to do so over the next couple of days which will make for some good conditions at altitude. Lower down some rain will make the pistes stickier though. 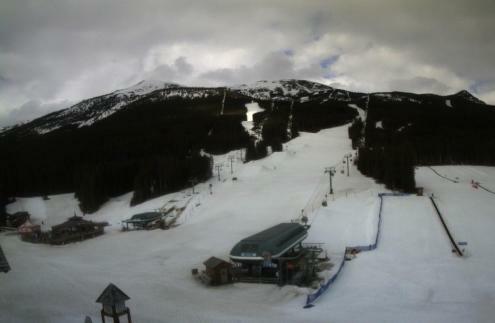 Further inland, snow cover remains excellent in the Banff/Lake Louise area (166cm upper base) though there will be some freeze-thaw conditions lower down and on slopes exposed to the sun.